The heart and soul of Geomancy lies in the interpretation of the chart cast. The Shield Chart is the most common Geomantic Chart, and provides the basis for other charts generated, which are generated by rearranging the Figures in the Shield Chart. Interpreting the Shield Chart, then, is one of the most important skills to master in the art of Geomancy. When I read Shield Charts, I do so in a very specific order and a very specific way. I always start my interpretation of the Shield Chart by reading the Judge, the Figure that sums up the rest of the Chart, being as it is derived from every single Figure present. The Judge is the Figure that best sums up the answer to the question that you asked, and represents the present situation, the relationship between past and future, and the relationship between the person asking the question and the question itself (or what or who the question is about). This is the most important Figure in any Geomantic Shield Chart, and so it deserves special attention. When interpreting the Judge, make sure to not only interpret the meaning of the Figure, but also its role in relation to the next two positions, the two Witnesses. After an initial examination of the Judge, I examine the two Witnesses, Right first and then Left. The Right Witness represents the past and the one asking the question. The Left Witness represents the future and the question’s influence. After examining how the Figure present fits into its position, and doing that for both Witnesses, one should go back and re-examine the Judge in terms of it serving as a link between the two Witnesses, paying any special attention to any similarities between these Figures. Following a close examination of the Judge and Witnesses, I then check to see if there is a Way of the Points. Often, the questions one seeks answers to are complex, and often the true answers lie hidden beneath several layers. The Way of the Points serves to help your inner guide find the true source of a problem if it is hidden. Divining the Way of the Points involves looking at the Fire, or Head, lines of the Figures. Start with the Judge’s Fire line, and note whether it has one or two points. Then, look at the two Witnesses. If neither of them have the same Fire line, then there is no Way of the Points, and the influences on the situation are in plain sight. If one, or both, of the Witnesses has the same Fire line, however, then the Way of the Points exists. Transfer your attention to the Figure(s) with the same Fire line, and then examine the two Nieces making up the Witness(es) on the Way of the Points. If any of them have the same Fire line, then they form part of the way, too. Repeat this process down to the Mothers. Wherever the Way of the Points ends – the last Figure to have the same Fire Line as the preceding Figure on the way – you can find the Figure that represents a hidden, underlying influence on the whole situation. Sometimes the Way of the Points ends with multiple Figures, and in this case all of these Figures contribute to the hidden influences. Once the Way of the Points has been formed (if it can be), and the Figure(s) making up its end located, one can interpret the Figure(s) just like it is a Figure in a position representing unconscious, hidden, underlying influences. 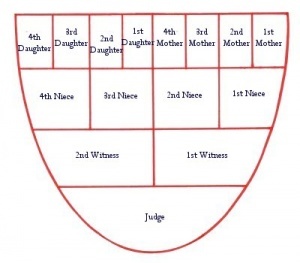 Once you have examined the underlying causes of a situation, I recommend examining the four Triplicities, each made up of one Niece and its two associated Mothers or Daughters. Each Triplicity is interpreted in the same way as the Judge and Witnesses, with the Right Mother or Daughter representing the past and the one asking the question, the Left Mother or Daughter representing the future and the question itself, and the Niece representing the present, the relationship between the past, future, questioner, and question, as well as the sum of the Triplicity. Each Triplicity also has its own meaning, and this is where their interpretations differ from that of the Judge and Witnesses. While the Judge and the Witnesses represent the situation as a whole, each Triplicity represents a specific aspect of the situation, and so when reading the Figures, one must keep in mind the aspect they are pondering. The First Triplicity represents the questioner, or querent, and their larger role in the situation. The Second Triplicity represents the role that large events and powerful forces shape the situation. The Third Triplicity represents the role that the querent’s home environment and family affect the situation, and the Fourth Triplicity represents the larger influence of society on the situation. Once each Triplicity has been interpreted on its own, I myself look at my own two sub-Triplicities. The first sub-Triplicity, made of the Right Witness and its associated Nieces, represents a more in-depth look at the Querent’s role in the situation, with a focus on how the Querent perceives the situation, and how that affects the answer to the question (Witnesses are never completely objective, after all). The second sub-Triplicity, made of the Left Witness and its associated Nieces, represents the larger role of the Question itself in the situation, as well as how others perceive the question and the situation. Once you have gone through the entire Shield Chart (adding your own personal interpretations, if you wish) as above, you may very well have a satisfactory answer. If you do not, then you may wish to rearrange the Figures into a different chart – such as the House Chart. Usually this is not necessary unless you are unsure of your answer or want a very in-depth analysis of the situation. Most of the time, the Shield Chart is more than enough! The Celtic Cross Spread is perhaps the single most commonly used Tarot spread in the Western world, or perhaps the entire world. It is generally the first spread – other than the simple three-card Past, Present, Future spread – that most Tarot books teach. The spread itself has been used so often that it has built up a lot of energy and interpretations as to its meaning. The Spread itself is composed of two parts: the Cross and the Staff. The two parts of the Celtic Cross represent the two basic polarities that inhabit everyone’s life: Yin and Yang. Yin, the masculine, is represented by the four upright cards of the staff, and reminds us that everything progresses towards a goal (the top card of the staff represents the ultimate outcome). Yang, the feminine, is represented by the four cards surrounding the central two in a circle, and reminds us that everything also has a cyclical nature. The two cards in the center of the Cross – the central and supporting factors – represent the resolution of the duality of the Staff and Cross. In Druidic thought, dualistic thinking is resolved through the creation of a third choice, to avoid living in a world dominated by either ors. The two central cards connect the Cross and the Staff, and represent the third choice; the two dots in the Yin Yang symbol colored differently than their surroundings. The Cross is on the left, and the staff is on the right. Those of you familiar with the Spread may immediately notice that I have numbered the positions differently than is standard. This is because, to me, the “standard” Celtic Cross numbering has never seemed to ring true, and the way above has always seemed much more natural to me; it was the way the cards naturally dealt themselves, rising from the influence of the unconscious to the influence of time, to the influence of the subconscious, focusing on rising through the levels of consciousness. Who am I to argue with the animus mundi? When I throw the spread, I lay out the cards in the above order. The card in the first position represents the central factor of whatever question you have asked, and tells you what the most powerful energy in any given situation is. The second card is the secondary factor, and it can be either supporting, neutral, or contradicting. If it is a supporting factor, its energy will be similar to that of the central factor, and will work in harmony with it (such as The Lovers and Love). If it is neutral, the energies will have no interplaying effects on each other. If it is a contradicting factor, the energies will oppose each other in some way. In all cases, the energy of the central factor takes priority and has the most strength, but its energy is modified by the energies of the secondary factor, changing it, strengthening it, weakening it, or sometimes, as in the case of a neutral factor, merely adding another layer of complexity and another central factor to the situation. After dealing those two, I deal the rest of the cross in a zig-zag motion, starting at the bottom, going up to the left, then the right, then up. As I said before, this just feels natural to me. The four cards of the wheel are the influences on the situation, and represent how the querent’s own mind and the passage of time affect the situation. The third position represents unconscious influences on the situation, such as what might be going through the mind of the querent (most commonly) or those closely involved with him that they are not aware of that shape the querent’s perception of the situation. If this influence is a card associated with deception, the querent may not be being honest with himself. The fourth position represents past influences; the weight of history and their past experiences, and how those things have shaped their worldview and approach to the situation. It can represent receding influences as well, and influences whose hold over the querent are weakening. The fifth position represents future influences or goals, and represents what the querent or others strive to achieve, and what might (remember that the cards do not tell the future) lie in store there. The sixth position represents conscious influences: those things that are at the forefront of the querent’s mind that they are very much aware of, affecting their actions with regards to the situation. If this card is associated with deception, then the querent (if it is not yourself) might not be being honest with you! It could also mean that they are possibly a dishonest party in the situation. The Cross is made of two axes: a vertical one and a horizontal one. The horizontal axis deals with the passage of time; on the left is the past and on the right is the future. The secondary factor (the second card placed) is also associated with this axis, as it lies horizontally. It represents the present situation as well as what I listed above, and the transition between past and future. I should note here than many practitioners of the Celtic Cross spread lay out the cards so that the past is on the right and the future on the left. This interpretation is seen in Geomancy as well. This is a perfectly valid viewpoint, and I believe it arises out of the common trend of many languages (particularly Semitic languages like Hebrew, from which the Tarot derives some of its symbolism) to read from right to left. As I am a native English speaker, I read left to right, and so also read the passage of time in that manner. The difference is as simple as that. The vertical axis of the Celtic Cross deals with levels of the mind, and how the querent acts upon and perceives the situation. At the top is the conscious mind, and at the bottom is the subconscious mind. As the central factor is vertical, it is also associated with this axis, and represents the ultimate reason for the querent’s interest in the situation, and the sum of their conscious and unconscious drives, as well as everything else discussed above. The three cards on this axis are reflected in Sigmund Freud’s conception of the mind: the conscious influences are the Superego, the police for of the mind that makes judgments and imposes values on the individual’s actions; the central factor is the Ego, which does its best to provide a realistic view of any situation; and the unconscious influences are the Id, the primal drives and unconscious desires that ultimately drive us all, and are repressed by the Ego and SuperEgo. The Staff consists of four cards aligned vertically. The seventh position represents the querent’s position, and in some ways serves to sum up the Cross. It represents the biases and prejudices the querent might have, as well as how they have been approaching the situation up to this point, how they are dealing with it, and their role in the situation and how they effect their surroundings. The eighth position represents environmental factors, and the querent’s relationship to everything that surrounds him or her. This can be the people surrounding him, the physical environment she lives in, or anything else. Most commonly, it represents the influences that the environment have upon the situation and the querent, but can also sometimes represent the influences that the querent as upon the environment (a role shared with the previous position). These two positions are also associated with the horizontal axis of the Cross. The ninth position represents the querent’s hopes and fears, as well as advice. it is strongly associated with the future influences position, as well as the secondary factors position. It is also a summation of the vertical axis of the Cross, and represents what the querent hopes to get out of the situation, or what they fear to lose from it. It can also give the querent something to think about, or a piece of advice that might help them deal with whatever is going on. The tenth and final position of the Celtic Cross is the summation of the rest of the spread. It represents the probable outcome of the situation. Depending on the way that the energies of the spread work out, this can either represent the result of things don’t change, or the result if the spread’s advice is followed (the latter is more common). It tells you how the querent, the environment, and everyone else involved will be affected by and changed by the situation when it is resolved. It is strongly associated with the central factor as well as the conscious influences positions, as it represents the central factor of what is most likely to happen given everything else, and serves as a sort of second central factor card for the spread. 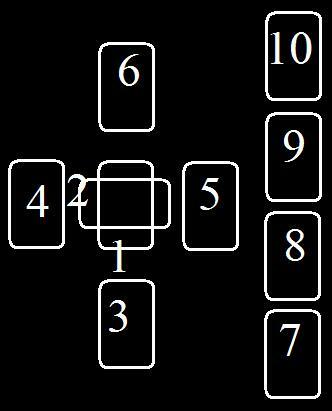 When I read any spread, unlike many people, I lay out the entire spread first before looking at the cards, rather than interpreting each card on their own before looking at their relationships to each other. This is a personal thing, and I feel like I can better understand the cards if I do it this way. Additionally, I do not read the Celtic Cross in the same order I lay it out. Generally, I begin with examining the first two positions, then move on to the horizontal axis of the cross (past to future), then the vertical access (unconscious to conscious), and then go onto the Staff. If I need clarification on anything, I generally look first to the cards linked with the confusing card’s position, then at the cards surrounding it and the general energies of the spread, and if that fails me, I draw another card.